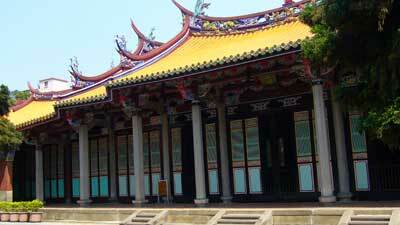 Go around the Da Cheng Temple, we will arrive at the rear court room, the Chongsheng Shrine. The Chongsheng Shrine is where Confucius' ancestors for five generations are venerated, including Chaosheng Duke Muchinfu, Yusheng Duke chifu, Yisheng Duke Fangshu, Changsheng Duke Pohsia and Chisheng Duke Shuliangho. Confucius' brothers, the fathers of Yen Tzu, Tseng Tzu, Mencius and Tzu Ssu, and the fathers of other Confucian worthies are also venerated here. In fact, this kind of arrangement has its roots in the Chinese clan ethics that have existed for several thousand years. The layout of Confucius temples is also very similar to that of a clan ancestral temple. The Chongsheng Shrine is as wide as five normal-sized rooms. The beams in the Chongsheng Shrine are the same as the ones in the Yimen Gate: one can see the beams and the carvings of the melon pillar. The frame has three beams and five short pillars. The melon pillars are carved into pumpkins or papayas, and look very round and substantial, both powerful and beautiful. The carved lions on the top, which seem to carry the beams on their shoulders, look as if they are real lions.